Why did I need another camera? I already have quite a few. I love my little Canon SD1000 -- it fits easily in my pocket and I can take it everywhere -- but I felt the need for a medium quality camera that would still fit in my pocket if necessary, but where I could control the settings more, and get a better quality picture. I love the Canons, so I settled on a SX110IS. The new features? One of the best places to try out the zoom lens is at the zoo. The San Diego Zoo is one of the best. Look at the detail the pieces of straw in the camel's hair. This was zoomed to almost 300mm in a 35mm equivalent. Miss Piggy's blond hair and warts are pretty sharp. The flamingos were very pink and must have a regular shrimp diet. This clouded leopard was in a show, and listened better than any cat I've ever seen. Unfortunately, I had not charged the batteries recently, so the rest of the pictures were taken with the tiny camera. The gorilla kids were having a great time putting burlap bags over their head until mom came over and put a stop to it. This Komodo Dragon seemed really interest in my hat. But of course the star of the San Diego Zoo is the baby panda. Sixteen-month old Zhen Zhen will be separated from Mommy in another 2 months, then sent back to China when she is 3 years old. This year I decided to splurge, and stay in a REALLY EXPENSIVE county park, Santee Lakes. Daughter Corrie lives in Santee only a couple of miles away. It's beautiful, with 7 lakes, and 300 RV sites. Even though it's pricey, the sites are all full. It's been pretty cool and rainy, which meant it SNOWED in the mountains. So last week we drove up to Julian so the kids could really experience snow for the first time. Mara and her Daddy made the world's smallest snowman. Jonathan didn't know quite what to do with the snow, but quickly figured something out. One good thing to do on a rainy day is make cookies! After Corrie cut them out, Mara decorated, sprinkling them lightly with sugar. I gave Mara a Big Girl Camera for Christmas. She's really quite the photographer. While Mara really opened presents in a hurry, Jonathan took his time. I got him a Thomas the Train flashlight engine. I think it was a hit. Although this was from Thanksgiving, I thought it was really cute to see the things that Mara is most thankful for. Finally, a Day When It's Not Raining! Every time I come to San Diego, it rains, and these 2 weeks have been no exception. It's gotton so bad that people call me and beg me to come whenever there's a fire. We finally had a fairly nice day and decided to go sightseeing. Our first stop was the USS Midway, retired in 1991 and now a museum. They have a wonderful self-guided tour where you punch in a number on a little gadget and they tell you all about it on your headset. This is where they controlled the speed of the ship, but not the steering. That was done on the bridge where they could see! The had lots of life-like manikins. The captain was nice enough to welcome us when we barged into his personal quarters. Notice how his eyes even blink! After wandering through the lower decks, we went up to the flight deck, where there were lots of different aircraft that once traveled on the Midway. Outside was a new 25-foot statue of the famous Life magazine photo taken in Times Square on V-J Day at the end of World War II. Next we headed over to the tide pools at Cabrillo National Monument. It was low tide, but I didn't see too many creatures. I think they've been picked over. Did see this critter, though. On to the old Point Loma Lighthouse, in operation from 1855 to 1891. The new lighthouse was built down the hill where it wouldn't be concealed by fog and low clouds. Sounds like a good idea! Also on the point, in the lower left corner, is the statue of Juan Cabrillo, the first European to enter the San Diego Bay in 1542. I've really enjoyed being with my family these last 2 weeks, and wish you and yours a very Merry Christmas! Stayed just outside the little town of Ocotillo, CA at a spot where the WINs used to have gatherings. My goal was to tour the southern part of Anza Borrego State Park. A lot of the park consists of "Badlands" like this. Nestled inside the state park is Agua Caliente Regional Park. It's best known for its geothermally heated springs, which have been developed into 2 outdoor pools and an indoor one. A day pass is just $5 for a carload, a real deal. I liked the indoor pool, where the natural 90-degree spring is heated to 102 degrees. There are also several nice trails at Agua Caliente. This is the Moonlight Canyon Trail. It starts off rather steeply, then winds around through deep washes. The Badlands contain a lot of washes, many of which have unpaved roads through them. This is Arroyo Tapiado, which means "Mudwall Wash."
It's pretty obvious where the road is, but some helpful person has put up a road sign. Wait a minute! Something's wrong here! While Arroyo Tapiado is fairly interesting on its own, the really neat thing is the many caves and slot canyons it contains. They were formed when landslides filled in slot canyons created by floods, and then additional floods dug tunnels through the bottom levels of the landslide debris. This is "Big Mud Cave." It used to be a cave, but has collapsed and is now more of a slot canyon. My favorite was this slot canyon, about 1/2 mile south of "Big Mud Cave." The entrance had an unusual arch. And the walls were sculptured with harder sandstone. There were many beautiful formations, such as this one that looked like a brain. Nothing gets me in the mood for Christmas as much as going to see my grandchildren in San Diego. Their tree was up, and decorated as much as it could be. Here's the reason why there are no ornaments on the bottom half. Jonathan loves Christmas ornaments as much as I do! One night we went to see the outstanding decorations on Glendon Circle. These people really go all out! One enterprising homeowner sells kettle corn. Mara and Corrie were really looking forward to that. The snowmen like to sunbathe around here. Or at least they normally do. The weather here has been cold and rainy. On Sunday, the local park had a snow celebration. In spite of the cold weather, they still had to cart the snow in from the mountains. Mara got a short sled ride. And she got to throw a snowball at Santa. Is that any way to guarantee a good Christmas take? They had a lot of really good rides there, and Mara went on them all. She has no fear! Here she and Brian are on one even I wouldn't go on. 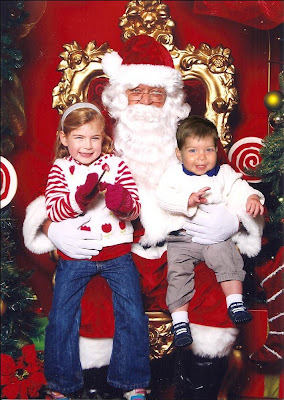 We went to see Santa, but Jonathan was at that "unsure-of-that-weird-looking-guy" age. But don't worry -- Grandma and her computer can easily fix that! You Want to Go WHERE??? And Do WHAT??? Okay, this post will prove that the WINs will do ANYTHING to amuse themselves. Someone (who shall not be named) decided that we really needed to see what was inside one of the 2 old water tanks at the Slabs. So after forming a ritual committee, and a safety committee, off we went. The first thing we saw was the home of "Half Pint." She lives happily here in this box. The paintings on the side of the tank were also very interesting. It turns out they were painted over a 2-year period by a member of the WINs! Who knew! You can tell what he has on HIS mind! The safety committee borrowed 2 large ladders from Leonard over at Salvation Mountain, and made sure they were secured, then over they went. I decided someone needed to be the official photographer. So I peeked over the top of the ladder into the tank. What in the world are they doing??? Some kind of jiggling ritual! Bagbipe Bob added to the ceremony. All too soon it was over, but not before they all left their mark on one of the columns.